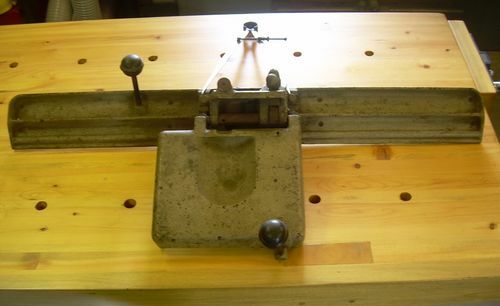 I’ve got an older Rockwell 8” jointer (37-315) that was in storage for a long time. When it was pulled out of storage, the fence took a hit and the left half is now missing. I don’t want to point fingers or anything, but it was definitely Steve’s fault (OP curses Steve’s name under his breath). So now I’m on the hunt for a replacement fence. 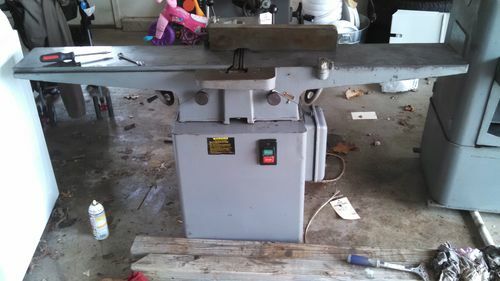 The tilt/lock mechanism is fine, so I’m just searching for a replacement fence, and thus far I’ve come up dry whilst searching for NOS, or people parting out this particular jointer. I’m now looking at the fences that Grizzly puts on their parallelogram jointer. It looks pretty similar to the set up on the old Rockwell, and it can be purchased directly from Grizzly. However similar doesn’t necessarily mean compatible. 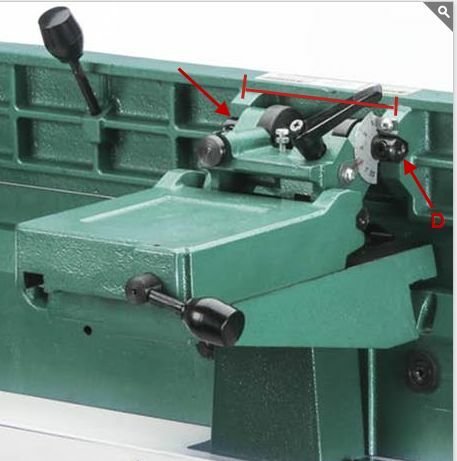 Several jointers out there use this design, so if anyone has a Delta, or Grizzly, or Shop Fox, or other jointer with this style of tilt/lock mechanism, would you please measure the diameter and spacing of the brackets on the fence? I will give you a virtual high five and/or hug for your efforts. bump. I’m sure one of your guys has one of these jointers. Bust out your measuring tape and let me know. Thanks! Did you check over at OWWM in the BOYD section, or post a WTB ad there? Yep. I posted it earlier this week. No responses yet. One guy did let me know that I just missed one on EBay, so I know they’re out there. I know this is an old post, but my question is pretty similar. 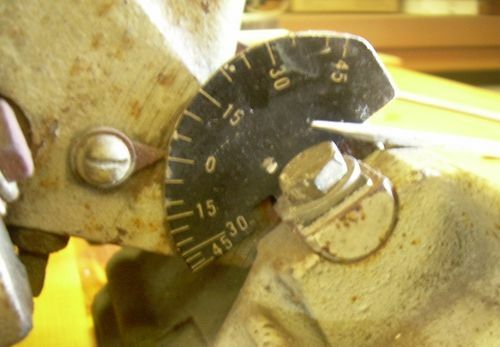 I am looking for an entire fence assembly for the delta 37-315 jointer. I just bought the machine, but it has no fence assembly. The fence base is on the saw, and that is where it ends. I am hoping to learn what TheGreatJon has about compatibility of other machine fence systems that are not obsolete. 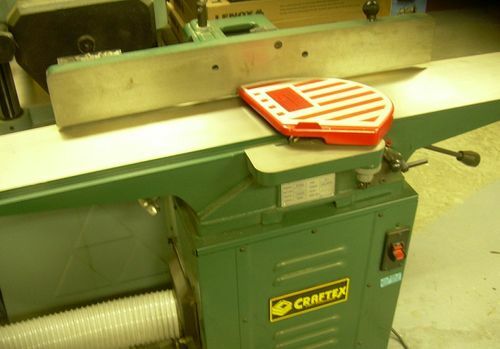 Has anyone attempted to attach a non-OEM fence to this jointer? You just had to make me dig it out ha, ha, lol. This is the fence and tilt assembly for your Rockwell 8” jointer, only this one is mine ha, ha, still waiting for me to finish the rebuild. The distance you want is the distance center to center of the mounting threads indicated by my divider. That distance is exactly 6”. Check out the last picture, the “Grizzly” may mount differently. That shaft that bolts the fence to the tilt assembly is 3/4”. Just noticed the initial post was three years old. Anyone know if the “Grizzly” fence fit. Thanks Carlos. Definitely needed the shaft info! I guess my question should be geared toward owners of the grizzly GO490, which uses the fence in the picture attached by TheGreatJohn. 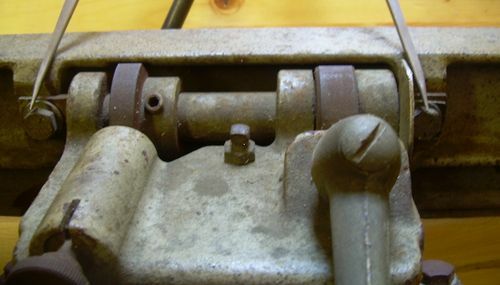 Can someone give me the dimensions of the shaft on the Grizzly saw that connect the carriage to the swivel? I called grizzly and they were unable to provide dimensional info. I did end up ordering the grizzly fence. It had the exact same attachment mechanism. However the mounting holes didn’t line up exactly. With a lot of grumbling, some elbow grease, and a round file I managed to get it to work. Nice work! So do you think the grizzly swivel will fit between the brackets on the delta carriage? Can you tell me the distance between the shaft holes/mounting holes on the grizzly fence? I should probably just buy a Grizzly swivel and shaft, but it would be nice to save $25 if it doesn’t look like it will fit. OK so there is a slight design change in the “Grizzly”. In the Grizzly fence the mounting holes are not threaded and go right through, The holes are counter bored on the fence side, the bolts are passed through and threaded into the 3/4” swivel shaft, which is why no milled flats. The holes in the Rockwell fence are threaded and do not go right through, The swivel shaft has milled flats and is not threaded so the bolts can be inserted and tightened from that side. That was a fortunate design change for you Jon. That design change tells me something about the quality of Asian iron. The designers didn’t trust the strength of Asian iron so rather than threading the iron fence they reversed the bolt and threaded the steal swivel shaft instead. The difference is the Asian design ends up with two holes on the face of the fence. Perfect thanks Carlos! Great info. Seems like it is going to work out good. Sounds like you own both jointers? No just the one 8”. My second jointer is a 6” Taiwan import by Busy Bee in Canada. The fence and adjustment design is a little different but there’s the tell tail signs, holes through the fence. Before the consumer tool industry gave up on North American manufacture and took production overseas, the machine iron casting industry had reached a fine art, strong and fine grained, thats not the case where they took it overseas, though it is improving, the number of import castings that I have broken over the years is proof of that. Poor melt control and course grain makes for weak threads if you try to thread it. That was a fortunate design change for you Jon. The designers didn t trust the strength of Asian iron so rather than threading the iron fence they reversed the bolt and threaded the steal swivel shaft instead. Yep. It was fortunate that it worked out. When I ordered the fence, I still wasn’t sure if it would work, but I figured that the worst case scenario was that I would have to drill some new holes in my jointer. Luckily the required modifications process very minor. And yes, you nailed it on the old American vs current Asian castings. It just takes too long to produce finely grained castings, and the companies can get away with the cost savings because in consumer-sized machine markets very few people know any better or care. David, correction, had a closer look at the Grizzly fence Jon used, the mounting holes do not go through the fence which means they are threaded from the backside, that also means Jon had to file the holes in the flats on the ends of the tilt shaft larger to line up with the threads on the fence.